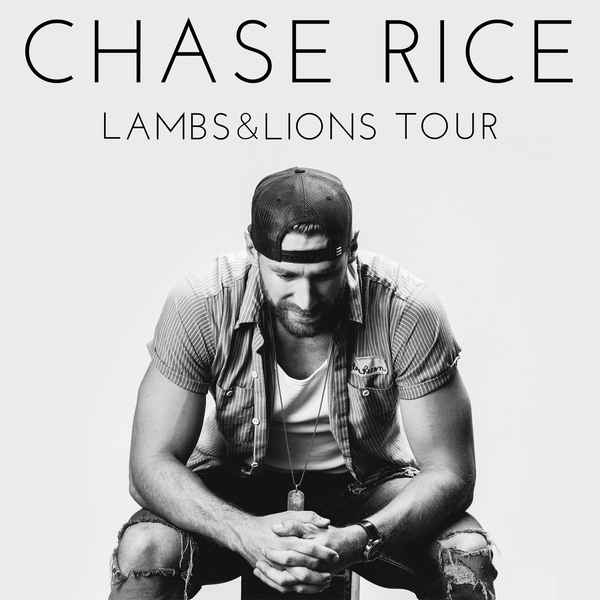 NASHVILLE, Tenn. – Chase Rice knows who he is as artist; and who he’s not. And he is set to release new music, with a new label partner BBR Music Group/BMG, and kick off a coast-to-coast “Lambs and Lions Tour” that strikes at the heart of what the industry outlier believes about reaching fans and making music that reflects more than the just the bravado that garnered the North Carolina native national acclaim. With the confidence that comes from writing and playing from a deeper emotional well, Rice is launching the “Lambs and Lions Tour” in Boone, N.C. at Appalachian State University. It ends two continents, three countries, six months, five support acts and 30 tour dates later at Atlanta's Buckhead Theatre. In between, he is playing gritty clubs, festivals, arenas, and some of the most revered music venues in the country. Unapologetic and fiercely independent, Rice is clearly comfortable in his own skin and on any stage. Rice has been one of country music’s most exciting figures since arriving in Nashville. He co-wrote Florida Georgia Line’s megahit Diamond certified “Cruise” and his 2014 major label debut album, Ignite the Night, opened at No. 1 and yielded two Top 5 hits with “Ready Set Roll” and “Gonna Wanna Tonight,” in addition to more than 900,000 in album sales. Rice initially released “Ready Set Roll” through his own Dack Janiels label and later partnered with Columbia Nashville for a wider release, though he never gave up control of his music to sign a long-term deal. He signed with BBR Music Group because of the label’s proven track record of fostering an independent spirit while still helping deliver hits for its acts including Jason Aldean, Dustin Lynch, Randy Houser, and Granger Smith, all artists who began as independents and continue to chart their own paths with millions of songs and albums sold. AT&T is sending customers to the front of the line with AT&T priority pre-sale ticket access beginning June 27 at 10 a.m. local time through Thursday, June 29, at 10 p.m. local time via the AT&T THANKS program. For complete pre-sale details visit att.com/frontoftheline. For more information, visit www.chaserice.com or follow on Twitter @ChaseRiceMusic and www.Facebook.com/ChaseRiceMusic.